Being pregnant for a second time has me thinking a lot about the different stages I've gone through with my son. The first weeks and months were so difficult that I actually didn't think I could do it. He cried from 3pm to 3am every day for a month. His naps didn't last any more than 15 minutes at a time and happened once or twice during the day. I honestly felt like there was nothing I would ever be able to do to make him happy. Some call it colic, some say it's indigestion, and I still don't know exactly why that phase was so hard. In hindsight, I know there were things I needed to do to take care of myself. Eating enough was number one. Yes, the baby was crying and I wanted to crawl in a hole just to get some sound sleep, but taking 20 minutes to make a decent meal for myself was not going to change any of that. What those 20 precious minutes would do is help me have muster the strength to make it, with at least an ounce of grace, through a very trying time. Yes, that was a hard time. But we have a healthy little boy who makes those first months totally worth it each and every day. He sleeps like a dream (worth more than gold if you ask me), gives the best hugs and kisses, loves bugs and "creatures" he finds in the backyard, and talks without stopping during every waking moment, leaving me with memories at the end of the day of the hilarious, and sometimes quite insightful things, I was blessed to have him share with me. Because I know what we could be facing with another little one on the way, the good and the difficult, I have been working on an arsenal of meals that are largely hands off and come together quickly. This citrusy shrimp & spinach spaghetti is the perfect 20 minute meal that is comforting, healthy, and so easy to toss together. In addition to all of that, it is versatile. Substitute spinach with chard or kale. Use whole wheat or brown rice spaghetti. Add shredded rotisserie chicken instead of shrimp. The possibilities are endless! And a bonus at our house: this one is picky-toddler approved! We are now at the half-way point of this pregnancy and I'm starting to feel all of the feels there are to feel about having a new baby. With how much we love Riley, it's hard to imagine how it will feel to have two littles to love. Heart explosions will for sure be happening on the regular around here! HELP: In my quest for easy meals, I'd love to hear what your favorites are! Links are welcome in the comments below! Bring a large pot of salted water to a boil. Add the spaghetti and cook until al dente, 8-10 minutes. 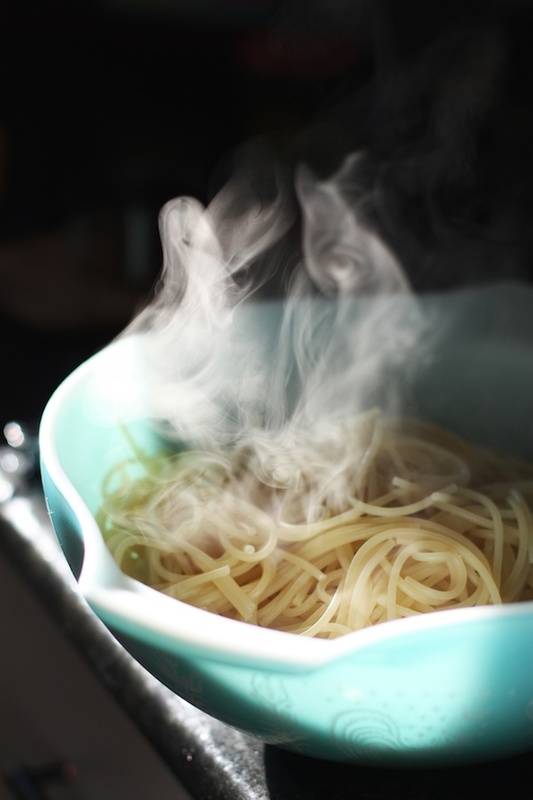 Before draining, reserve 1 cup of pasta water and set aside. Meanwhile, combine the orange juice, lemon juice and olive oil in a jar with a tight fitting lid and shake to combine. Put the shrimp in a large bowl and toss with half the olive oil mixture. Spread the shrimp on a baking sheet lined with foil and roast for 6 minutes or until pink and just cooked through. In a large bowl, toss the spaghetti with the shrimp and the remaining citrus oil. Add the spinach and season with salt and pepper. Scoop into serving bowls and sprinkle with grated parmesan cheese.